MYTH 1: The Pula arena is the sixth-largest Roman amphitheatre and one of the best preserved. 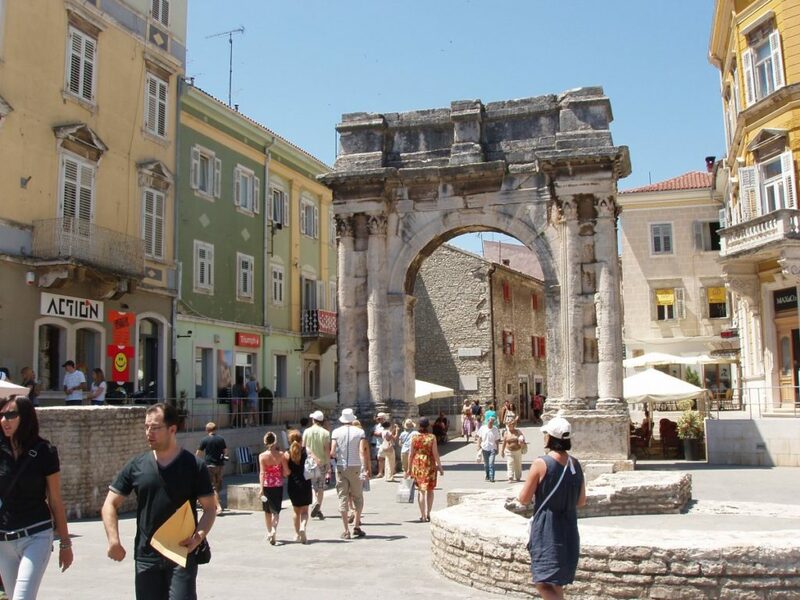 CONFIRMED: The start and end point of every sightseeing tour and the town’s most famous and important monument, the Amphitheatre, popularly called the ‘Arena of Pula’, was once the site of gladiator fights that used to entertain up to 25,000 spectators. It was built in the 1st century AD, during the reign of Emperor Vespasian. The Arena is the only remaining Roman amphitheatre to have four side towers and with all three Roman architectural orders entirely preserved. 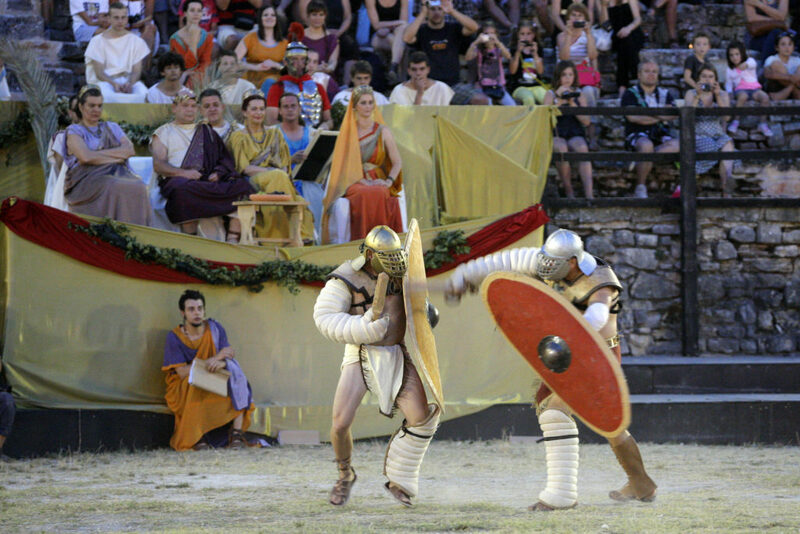 Every week during the summer months the Arena hosts gladiator fights as part of the historical and entertainment spectacle “Spectacvla Antiqva”. 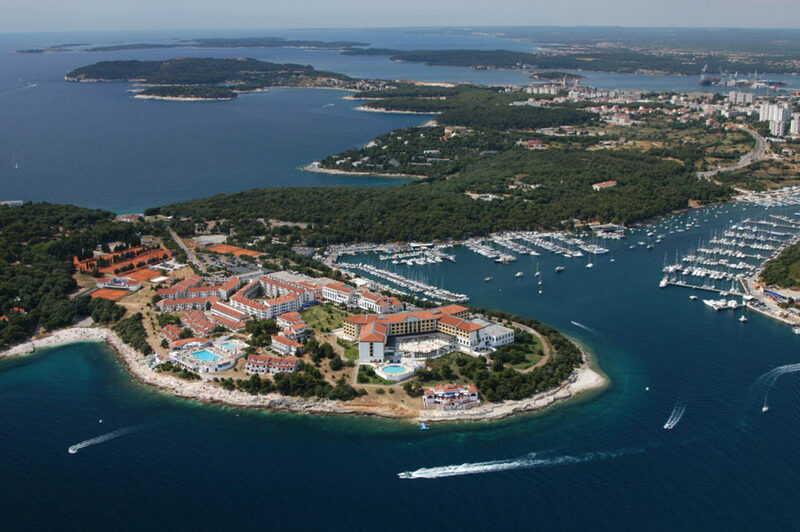 MYTH 2: Pula’s coastline is more than 4.5 times longer than the entire Slovenian coast. CONFIRMED: Pula’s great tourist asset is most definitely 190 kilometers of coastline with crystal clear water and beaches. MYTH 3: Pula was taken over by Giants. BUSTED: Of course it wasn’t. However, Pula did acquire an interesting attraction: The Lighting Giants is a globally unique project of lighting cranes in an operating shipyard. 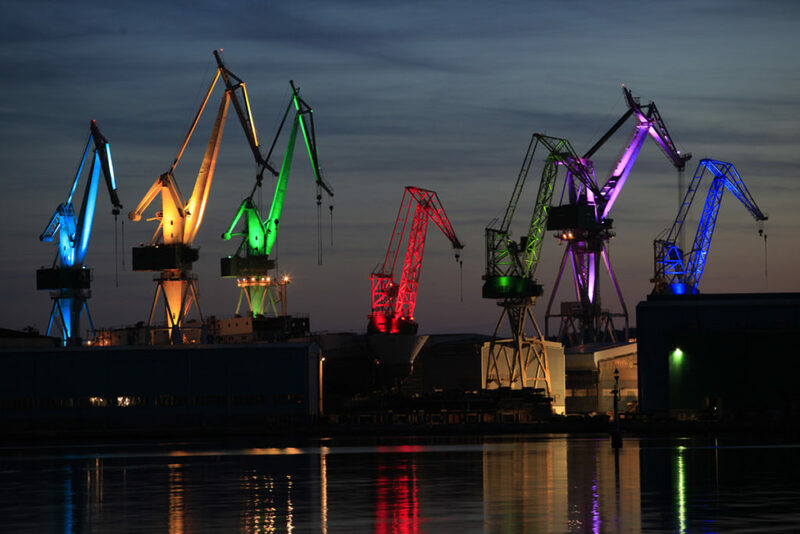 Dean Skira, the world-famous lighting designer, together with the help of sponsors and the workers of the Uljanik Shipyard, has managed to light up the shipyard’s iconic cranes, a characteristic symbol of Pula. “Lighting Giants” have a sophisticated remote control system of lighting and scenography, and can be illuminated with 16,000 different colour combinations in a show that lasts for about 15 minutes. 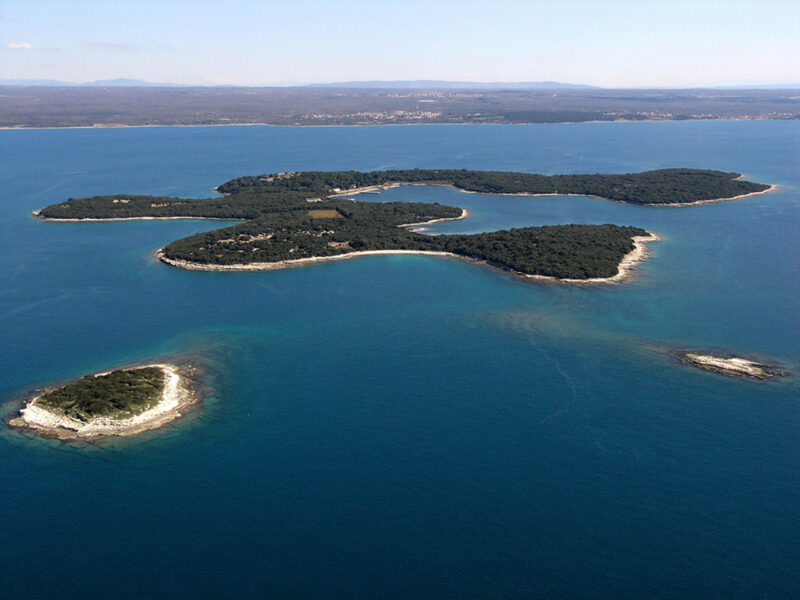 MYTH 4: Next to Pula one can find one of the most beautiful national parks in Europe. CONFIRMED: The Brijuni Islands, or the Brijuni archipelago, is today one of the most attractive tourist destinations in Croatia and are synonymous with for elite tourism. This archipelago consists of a group of islands off the western coast of Istria, which together with the surrounding waters was proclaimed a national park in 1983. The Brijuni was also the summer residence of Josip Broz Tito. World famous celebrities such as Elizabeth Taylor, Sophia Loren and Richard Burton were Tito’s guests in his Brijuni residence. CONFIRMED: The record for the largest photograph of people forming a light sign, known as the “Light Postcard”, was broken in the Arena as a part of Visualia Festival. 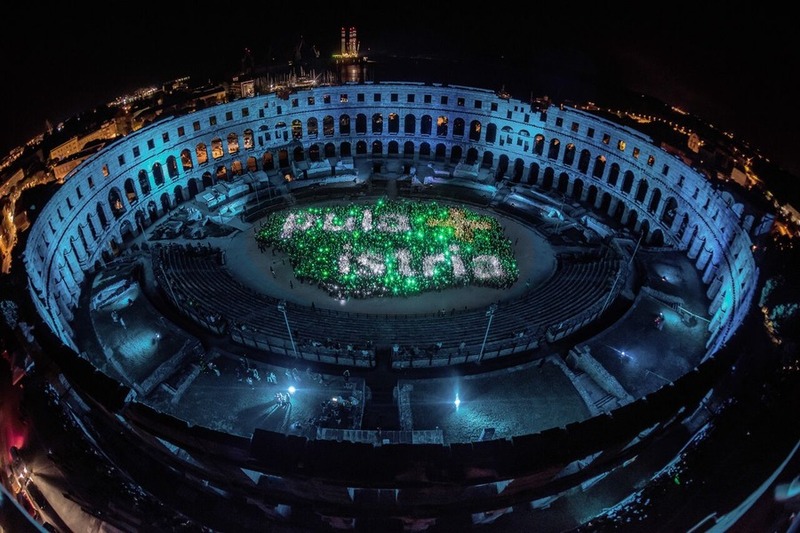 The previous record (3,777 participants) was broken with 4,013 visitors in the Pula Arena forming a sign “Pula+Istria”. MYTH 6: Pula is a fairly new, boutique city in Croatia. BUSTED: Couldn’t be further from the truth. The city has 3,000 years of history starting with the myth of the Argonauts and the search for the Golden Fleece. It was the home of the Histrians, the Romans and the Venetians. Once the central Austrian port, today it is the largest cultural and economic center of Istria, with a population of about 62,000. MYTH 7: Pula inspired James Joyce and Dante Alighieri. CONFIRMED: In 1904, James Joyce, one of the most preeminent Irish authors of the twentieth century, came to Pula to teach English to Austrian officers at the Berlitz language school. Despite calling Pula a “naval Siberia”, he is thought to have written part of his first novel Stephen Hero there and was working on his classic A Portrait of the Artist as a Young Man. A bronze James Joyce now sits at Uliks (Ulysses) cafe in Pula. Moreover, Dante Alighieri wrote parts of his Divine Comedy in Istria. He positioned Pula in Hell on account of the horrendous consequences of the plague that struck the city during the Middle Ages. 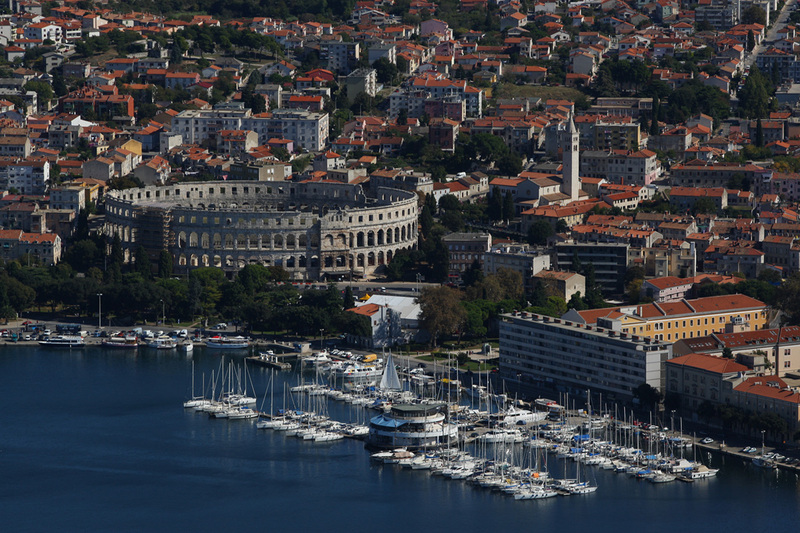 MYTH 8: Pula is not the city to organise a special event at. BUSTED: Where better to find a special venue than in Pula. 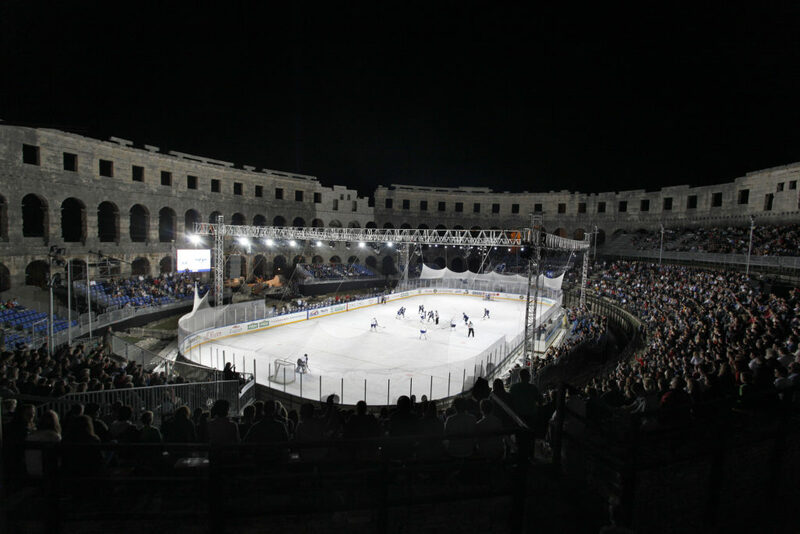 Venues like the Pula Amphitheatre, which can seat about 5,000 spectators, Fort Punta Christo – one of the most beautiful fortifications of Pula – Villa Vulin as the first Croatian five-star boutique hotel, Park Plaza Histria that is Pula’s premium award-winning hotel, House of Croatia Defenders – a breathtaking palace from 1872 that is today used for many concerts, assemblies, exhibitions, fairs, dances and balls – are just some of the many that Pula has to offer. 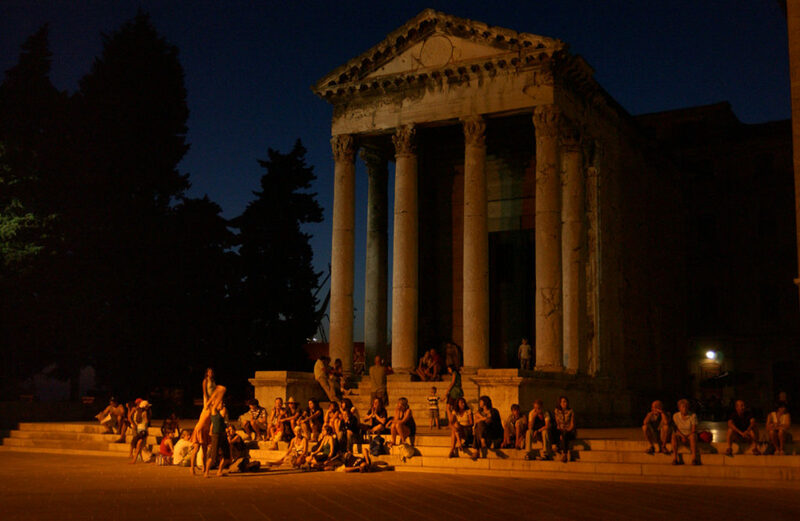 MYTH 9: Pula is considered to be one of the festival capitals of Croatia with more than 1,000 events annually.